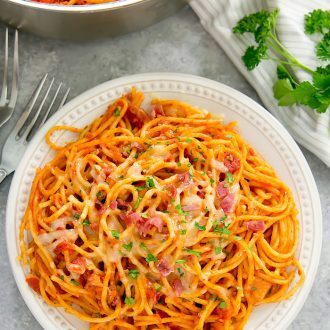 One Pot Bacon Four Cheese Pasta is ready in less than 30 minutes for an easy meal with minimal clean-up! In a large skillet, add the chopped up bacon and cook until done. Drain out bacon fat and leave bacon in the skillet. Add water, spaghetti and sauce to the pot. Cover skillet with a lid (preferably one that is clear glass and has a ventilation hole. If your lid does not have a ventilation hole, leave the lid slightly ajar to allow ventilation. Bring pot to a simmer. Allow it to cook for about 16 minutes, stirring about halfway through to make sure pasta is fully submerged in liquid and nothing is sticking to the bottom of the skillet. Remove lid after 16 minutes. Pasta should be cooked and most of the water should have evaporated, leaving a thick sauce. If you feel that the sauce is still too watery, cook for another 1 minute with lid off which will further reduce the liquid in the sauce. If desired, sprinkle shredded parmesan cheese, parsley and then close the lid (with skillet still on stove and heat off) for 1-2 minutes until cheese is melted. Dish and serve with salad or your choice of vegetables.